Fisherman Joseph Pedrero lost 11 members of his family, including his wife, children and mother, during Typhoon Haiyan. 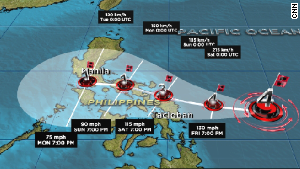 Tacloban, Philippines (CNN) -- For Joseph Pedrero, the thought of another massive tropical storm bearing down on his home in Tacloban is traumatic. 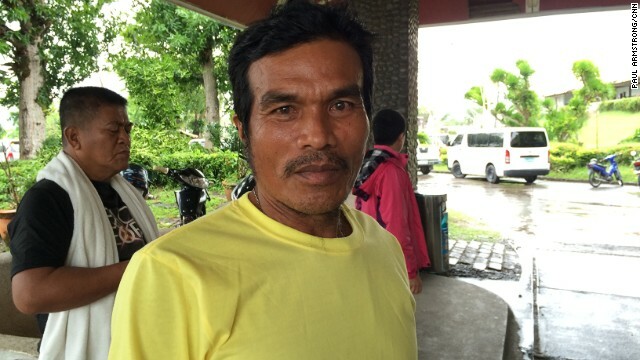 The 46-year-old fisherman lost 11 members of his family, including his wife, his three children and his mother, when Typhoon Haiyan lashed the central Philippines in November last year. 'We weren't prepared last time. We were confident we'd be safe because we have a stone house and everything we need with us," he said. "But we did not expect that a storm surge would be coming and take all our family away. We were not given information that a great wave would come." Tragically, only six of his family members were ever found -- and they're now buried close to his modest home. It's difficult to look Joseph in the eyes. It's impossible to understand what he has been through. A year on and what remains of his family are leaving their homes to move inland to stay with relatives. "I've been following developments on the radio this time," he said. "The government is now providing better information. I'm scared but at least I know what is going on. Yesterday, the mayor visited us and told us to vacate our homes for our safety." Tacloban's mayor, Alfred Romualdez, has ordered the forced evacuation of several coastal "barangays," or neighborhoods as a precaution -- hundreds of people. These areas are usually made up of rudimentary shacks -- exactly the type of structures washed away during Haiyan -- owned by many of the area's poorest residents. The local police are now doing sweeps of the area ensuring that people comply, with women and children being prioritized and taken to dozens of evacuation centers around the area -- part of a massive operation across the country that has seen almost half a million people in the path of storm moved to safety, according to the UN Office for the Coordination of Humanitarian Affairs (OCHA). "When I took the decision a few days ago to close schools, people questioned me. But now they realize I wanted students to have time to return to their families in other areas so that they could prepare properly," said Romualdez. He said one of the biggest problems last year was the sheer volume of people they had to help. "Many were coming in from outside Tacloban and saying they were from here," he said. "When we asked them which barangay they came from, they said 'Barangay 19 or 23!' But when we asked the barangay captain if he knew them, he'd often say no. "But for humanitarian reasons, we'd have to shelter them. But we could only do this for a day or so then send them away." We weren't prepared last time. We were confident we'd be safe because we have a stone house and everything we need with us. It's now Saturday morning and the center of Tacloban should usually be a bustling hub of activity, the scene is eerie. Barely a handful of people are on the streets, with most businesses shuttered. The few shops that remain open seem to have plentiful supplies on their shelves, and no real queues to speak of. Everyone seems more organized. People respect what they're being told. Haiyan is all too fresh in the memory. Like many others people in Tacloban, it took Joseph months to rebuild his home -- and his life -- after such an appalling tragedy. Sadly he expects to rebuild his home once again if the storm reaches anything like the velocity it did a year ago. Even if Hagupit -- known as Ruby here -- hits further north as current predictions suggest, the sheer size of it will be felt here in Tacloban. Joseph seems resigned to this. "We're sad. 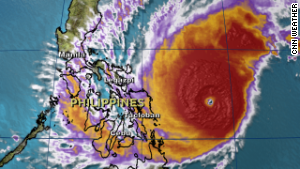 We fear this typhoon will destroy everything again," he said. "We're still rebuilding and now another typhoon is coming." Asked if he's considered moving away from an area prone to these kind of destructive storms, he replied: "No, I can't do anything because my life is here. I work on the sea. "But now we're willing to evacuate when we hear about these storms." And that is the biggest difference between this year and last.